It’s the age old question Rent or Buy? An old friend of mine told me once that the only reason to buy was to have control over your environment. (Own pets, add living space, remodel, etc) While I understand his point there is more to owning a home than control. The financial benefits of home ownership and tax savings spring to mind. 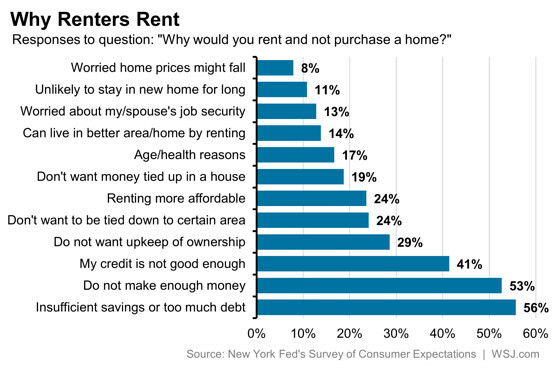 So why aren’t more renters taking advantage of these benefits and purchasing homes? Nick Timiraos explored that question in his article ‘Why More Renters Aren’t Buying’ in the Wall Street Journal Business Blog. It’s pretty straight forward when you see it in this format, renters are concerned about their income and debt affecting their ability to buy a home. Something to chew on until my next post.